I read an article in the paper today by the Associated Press, stating 45 states are planning to adopt national curriculum guidelines in English and math that don’t include cursive handwriting. These 2014 guidelines, will however, require students to be proficient in computer keyboarding by the time they exit elementary school. Thank God, not all states agree. 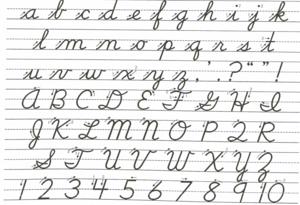 California, Georgia, and Massachusetts, have added cursive to their requirements, some states have left it as an option, while other states are still riding the fence. I can hear the outcry already from some of you reading this post. “It’s outdated, antiquated, everyone prints, we’re a digitalized society, every thing is done on computers,” and, the list goes on. In fact, those are some of the arguments used by the states eliminating cursive from the curriculum, but I want to present my view. Let me first disclose I love my tech gadgets. I have an iPhone, two Mac’s, and a Kindle. I am somewhat addicted, I admit, but I also appreciate and love things from the past. Although, I love the convenience of downloading a book instantly or being able to carry thousands of books in my purse, there is nothing that can replace the feel of turning a page or the smell of a hardback book as I sit entranced, cuddled up reading by the fire. And while my iPhone maybe attached to my hip, and I love being able to access my emails, documents, calendar or make a call whenever I want to, I hate texting with a passion. I believe it is the number one thing that has changed the way we as human beings interact and communicate with one another, especially forming intimate bonds. People have stopped talking to each other and we’ve lost the art of communication. Every week I receive in my email a letter, usually old and written in cursive. Letters of Note, are letters, cards and postcards from all over the world, each one with a story to tell. The eloquence of their words make me wish we still wrote letters to one another. The cursive handwriting, itself tells a story. I look at the pictures of the letters and it’s as if I am seeing the person who wrote the letter. I feel their spirit. The letters are touching; they move me. They, make me laugh, cry, cheer me on, and sometimes make me wish I had lived in a different time. Don’t misunderstand me. I’m all for progress, but we shouldn’t lose who we are in the process. We shouldn’t forget where we came from or who are. We shouldn’t throw away something that reveals so much of who we are. How many times have you watched someone run their hands over the handwritten page of a letter to feel the words written from the soul of their loved one? It’s as if they could feel them. It may sound like a simple thing, but a signature is more than our name. It represents us, our honor, our integrity, our word. Somehow taking that away from our children in the name of progress, just doesn’t feel right.